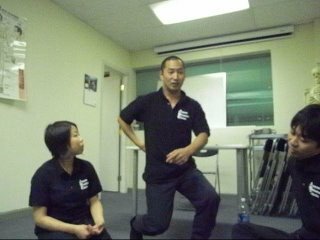 December 25th, 2010, Continuing Professional Eduation Program, Jikiden-kai was held at Yaletown Clinic. It was the last workshop in 2010. 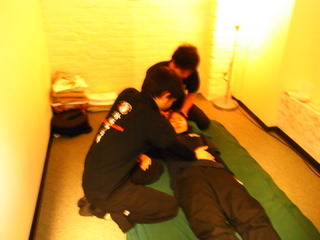 We did whole-body basic Shiatsu treatment each other to relieve fatigue of the year. We reviewed Namikoshi-point, Supra scapular, Lateral crural 1st point and Lateral antebrachial 1st point which are important treatment points. I was so impressed to see such a great number of members at the workshop which was held on the Christmas day. It proves how aspirational the members are. November 29th, 2010, Continuing Professional Eduation Program, Jikiden-kai was held at Yaletown Clinic. The theme of the workshop was 'Abdomen Shiatsu'. Needless to say, the treatment on Anterior cervical region and Abdominal region is the feature of Shiatsu. We reviewed the reason why the abdomen Shiatsu is important. There comes the 10th cranial nerve which is named vagal nerve and also classified into parasympathetic nerve all around the organs. Sympathetic nerve tends to over perform in the stressful world. 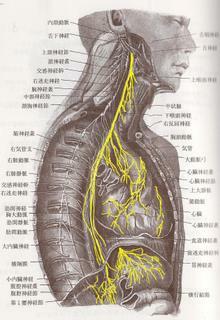 So it is useful to rejuvenate vagal nerve to normalize autonomic function. Of course, it helps to activate organ’s function, too. A lot of lymphatic vessels and lymphaden are distributed in the circumference of small intestines. Moreover, 60% of the entire lymphocyte has concentrated on small intestines. Abdominal aorta runs vertically downwards the abdomen. It connects and nourishes lower limbs. Abdominal Shiatsu is necessary for not only to improve circulation of abdominal viscus themselves but also lower limbs. Stomach muscles and iliopsoas are antagonist muscle of erector spinae muscles. Easing these muscle tensions is especially indispensable to the patient who has too much curved lumbar spine. 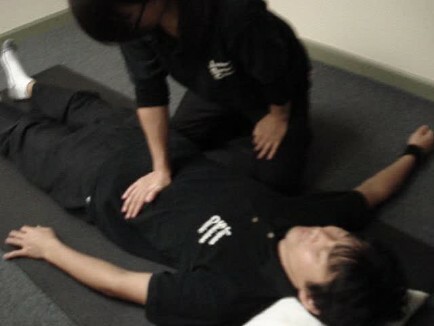 Afterwards, the abdomen Shiatsu was demonstrated by Kiyoshi. When you apply palm pressure, use the center of palm, not the carpal region. Keep your hand flat on the body, imagine as if you were a frog. It is called Kyu-in Appou (Suction). Getting tender, getting warmer. Coldness region is also a considerable point for a treatment. Apply pressure slowly so you can sense the condition of the area you touch. 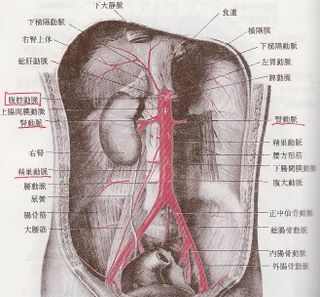 Lower abdomen is important point for especially for women (uterus and ovary). Treat till the edge of pubic bone. Apply pressure as deeply as possible. To treat liver, apply pressure upwards from the right hypochondrium. Treatment between ribs is also required for additional liver. As you saw above, abdomen Shiatsu is very effective. It's difficult to include abdomen treatment in a short session. But I believe that increasing the knowledge of the importance of Abdomen Shiatsu and practicing it help you have confident. October 24th, 2010, Continuing Professional Education Program, Jikiden-kai was held at Canadian College of Shiatsu Therapy Main Campus. First of all, Taro who had worked as a Shiatsu Professional in Japan made a speech about the present condition of Shiatsu in Japan. We were surprised that he had to work in the clinic until 2 am for the businessmen who worked deep into the night. He said the bodies of the clients who came to the clinic at that time were really hard like the board and since he has started working here in Canada, he feels the differences between the Japanese businessmen’s stiffness and Canadian one. 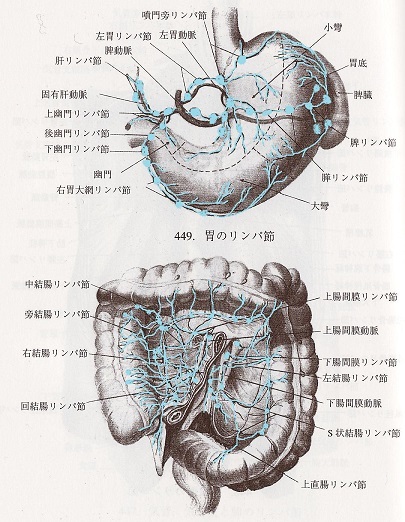 He was confused at first because the staff was not only the graduate from Namikoshi, but he could learn so many things from his coworkers, for example, how to examine the body from an anatomical viewpoint and how to adopt the idea of the melidian and trigger points for the treatment. Taro thinks that on management Shiatsu clinics in Japan have to devise the great services plus some benefits because there are too many treatment facilities by hands such as massage, chiropractic, and bone-setter and facing the intense price-war. Also in Canada there are some competitors like chiropractic or physiotherapy which the insurance is covered by the government, however, some of his clients told him how Shiatsu treatment effects on their conditions even after they tried to have chiropractic or physiotherapy. He believes if each one of us improves the level of our skills and diffuses Shiatsu to many people, there is a potential to develop Shiatsu. Everyone was so encouraged by his word and moreover we thought anew we have tried to keep it up. After his speech, we discussed "Referred pain=a pain caused by bad condition of an organ". 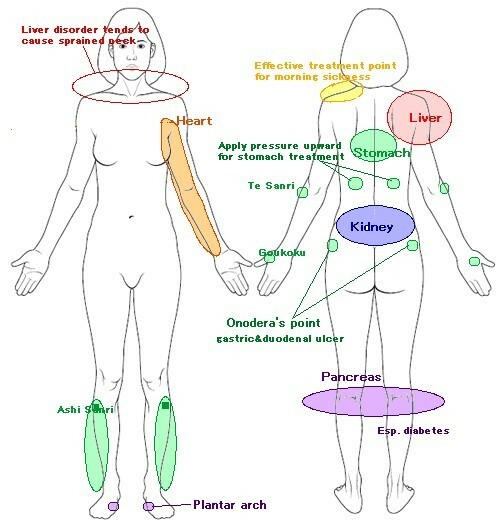 Please see the illustration on ther left which indicates the reactive regions of specific organs and treatment points. September 27th, 2010, Continuing Professional Education Program, Jikiden-kai was held at Canadian College of Shiatsu Therapy Main Campus. The theme was "The affected area and the associated areas". To begin with, Mayumi explained about last workshop's theme which was "Introduction about the research results:"The effect of Shiatsu on gluteal region on the pelvic inclination" by one of our members Tetsuya Hirota". Q: After the attending the last workshop, have you treated on the clients who has lumbar problem? Kanako T: She asked the clients to bend forward and if the client feel the tightness on hamstrings or calves, she explained and treated on the lower limbs as well as the lumbar. And she could get the effectiveness. Q: For the treatment on the lumbar, did you treat any other regions except lower limbs? Yusuke: He mainly treat on the affected area and can get the enough result but he's heard the treatment on the abdomen is also effective. Kanako T: She treated on abdominal region as well as on the lumbar when the session time is enough long and the client mentioned the mental stress. The clients told her after the session that the abdominal treatment made feel better, refreshed and with a clear mind. Q: Have you get any effectiveness when you treat on associated areas as well as the affected areas? where are they? Toshinori: He usually treats on the pectral region when the chief complain is the back. Q: Finally, I asked Kiyoshi. Should we still treat on the associated areas as well as affected area even there aren't enough time? Kiyoshi: It depends on the clients' conditions. But the treatment on the abdominal region and the anterior cervical region is very important. He shared the story about Master Namikoshi Tokujiro. He treated the longest-living man in Japan and the man's abdomen was very soft like a marshmallow. Kiyoshi also have the same experience when he treats on the elderly people like being more than 90. So, treating on and keep the soft abdomen is the key to be healthy for the rest of the body regions. However, treating on the affected areas or requested areas is important. When you need it, you can explain and treat on the associated areas too, in that case, you can recommend to extend the session time to make the client:s condition better. If you show the effectiveness, the client must be satisfied and have a deeper trust. After the discussion, the members practiced on each other. The member make a treatment plan and treated the partner's affected area and associated area. The comments from the participants!! August 26th, 2010, Continuing Professional Education Program, Jikiden-kai was held at Canadian College of Shiatsu Therapy Main Campus. The main topic of the workshop was an introduction of the research of the theme "The effect of Shiatsu on gluteal region on the pelvic inclination" by Hirota. To sum up his research, treating not only affected area (lower back) but also hamstrings and calves improves tense muscles on lower back. (Please contact Ikuko for more detailed handouts!) We were interested in the methodology how to prove the effect of Shiatsu in a scientific manner as well. Afterwards, Yoko Sensei spoke the experience of the Shiatsu to the infants. She instructed how to treat their back; applying pressure by four fingers while holding the infant. She also mentioned that it was essential to communicate with the parent well for a baby to relax. At the end, we did Shiatsu each other in a pair, focused on gluteal area and lower limbs. July 27th, 2010, Continuing Professional Eduation Program, Jikiden-kai was held at Yaletown Clinic. The theme was "Whiplash". Like the last time, we discussed about the theme in two groups first. Then we shared what we had discussed sitting in a circle. Whiplash causes many symptoms, and we therapists need to have knowledge about it. But we should more focus on how to remove the client’s discomfort rather than book knowledge. The theme of the workshop is whiplash. As before, we were divided into two groups and discussed the causes, symptoms and treatment of whiplash. We all have basic knowledge about whiplash through studying and clinical experiences. It was new for me to learn that we should not stick too much to what is accepted as common knowledge, for example, not applying Shiatsu when the person has inflammation, or that Shiatsu improves blood circulation. 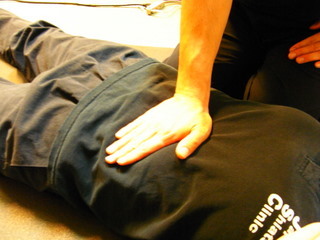 The effect of Shiatsu varies from case to case. What we can do is, first of all, to feel the muscle condition and know what the client wants. When there is a way to help the pain, we should explain the purpose of the treatment to the client. One way is applying Shiatsu from a distant area, avoiding sensitive areas of the body or thoroughly giving palm pressure. The important thing to keep in your mind is applying Shiatsu with the best intention and confidence. After the discussion, the members practiced on each other. I could hear their conversations including chatting. Each pair talked freely about topics such as today’s theme, technical concerns, difficulties encountered in working at the satellite clinics, recent improvements, or things we have been trying. It is good to share these feelings and opinions with each other. It is encouraging and beneficial to hear all feedback from clients, both good and bad. 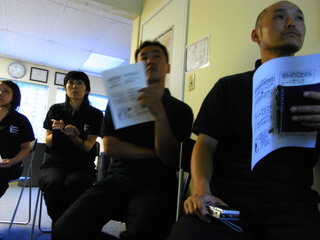 June 28th, 2010, Continuing Professional Eduation Program, Jikiden-kai was held at Yaletown Clinic. The theme of the workshop was "Headache". We started with discussion about mainly three things. 1. How to distinguish the headaches which are based on serious diseases such as brain disorders. 2. How to distinguish the most common headaches; tension headache and migraine. 3. How to treat these headaches. After the discussion, we practiced the treatment for headache in a pair. Today’s topic is "Headache". This is my first time to attend the workshop of Continuing Professional Education. We were divided into groups to discuss about headache: type, how to distinguish and treat. We work on headache caused by tension and apply pressure on around the neck. It’s also effective to apply pressure on abdominal region to stimulate autonomic nervous system for this kind of headache. After that we practiced treating it on partner. I had Ikuko Sensei who had stiff muscles on the neck. "Apply pressure here", "And toward to the core of the body" she gave me advices such as how much pressure, exact direction and where the effective points are and it helped for me to understand that I practiced one by one with her. My turn came! I used to sometimes have head ache with tiredness of eyes when I had very tight neck and shoulder. I asked her to work on them though I didn’t have head then. Having Shiatsu to know how much pressure is effective and feel the body relaxing is very important. I had very nice relaxing time with her Shiatsu! See, practice, receive and we exchange ideas and thoughts through our experiences as well. I’m looking forward to next workshop, too! 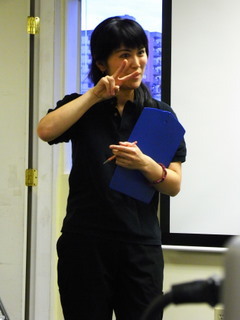 May 26th, 2010, Continuing Professional Eduation Program, Jikiden-kai was held at Yaletown Clinic. 1: Questioning the patient and conduct a test for Lasègue’s sign. 2: lateral side position: Apply the basic Shiatsu treatment on the lumbar region, sacral region, gluteal region, and femoral region. (the basic Shiatsu points of the lateral femoral region, points located anteriorly along the lateral femoral region, point located posteriorly along the lateral femoral region and the basic Shiatsu points of the lateral femoral region with the flexion and the extension at the lower limb by the patient’s active movement). The reason for operating the active movement not the passive movement is because using both hands is required to give a stable pressure. Operating this for about 10 minutes is effective. Apply pressure on the Dermatome regions for L4-S3 and stimulate the sciatic nerve using the cutaneous reflex. Apply the pathological reflex points A.K.A. “Aze-no Tsubo”. 3: Prone Position: Apply the basic Shiatsu points or “Aze-no Tsubo” from the lumbar region to legs. Conduct the test for Lasègue’s sign again to check effectiveness. After the demonstration by Kiyoshi, members practiced each other. The approach of applying the Shiatsu pressure with active movement impressed me. During practice I noticed more clinical experiences will be required to be effective, because it was quite hard to stabilize the patient’s position. I also found it difficult to indicate the direction of the active movement properly. I’d like to keep practicing more and more. I look forward to the next workshop. April 26th, 2010, Continuing Professional Eduation Program, Jikiden-kai was held at Yaletown Clinic. The workshop was warmed up by a total of 14 members. Today, the workshop was on the practice of Shiatsu exchange with the each one’s partners. It was done with whichever the body part I want to practice by my way and with whichever the body part I want to receive from the partner by the partner’s way. My partners were, it was an honour for me, Kiyoshi, Kazumi Sensei and Ikuko Sensei. Of course, there were the other 12 ISI fellows were working hard with sweating next to me. Through the time that I exchanged Shiatsu with the fellow workers who have same concern and have various experienced, I became so much impressed with their passion and constant training about Shiatsu. OK, I enjoyed it! Folks, have you ever heard the Shaolin kung fu? What about Shaolin fist martial art (少林拳法) among others? You would have had it on Hongkong movie once. What about Kung Fu Panda! At the Shaolin temple (少林寺) in China, there is a many hundred years of tradition of fist martial art training among the monks. Someone does Mantis fist martial art (螳蜋拳), someone does Dragon-Tiger fist martial art (龍虎拳), Snake fist martial art (巳拳)and so on, the practitioners borrowed the each wild animal’s behaviour about attack and defensive instincts, and they have developed their own fist martial art as their specialized skills. However, Mantis fist martial art (螳蜋拳), Dragon-Tiger fist martial art (龍虎拳), whatever the someone’s specialized martial art is, every one has its own both of advantages and disadvantages. Thus, the practitioners try to do constant practice to further develop its advantages and to supplement its disadvantages despite those are their special skills. The way how to do their practice is pretty simple, nothing special. This is such a form that they try to learn each one’s skill, and they try to inherit many of their ideas from others. Sometimes they have a match their skills. They have a match in between Mantis and Mantis as same type, and they also have a match in between Mantis and Dragon-Tiger as different typed fighter. The practitioners do actual experiments and become an object of the experiments. Because, before the actual doing, they don’t know themselves with only the theories. So, somebody can begin sharing the common ground for the practitioners. Ok, now what? Let me talk about Shiatsu. Shiatsu Professionals may seem similar to this. Someone is seasoned practitioner about head, neck, shoulder body part, someone is well-acquainted about back, spine, and someone has big confidence to treat on lower back and pelvic areas, someone has a lot of experience on the limbs. Each shiatsu practitioner has so many different cases of patients, and has various points of view, specialized skills, special experiences about the cases. Indeed, there are too many case of disease to list at here. 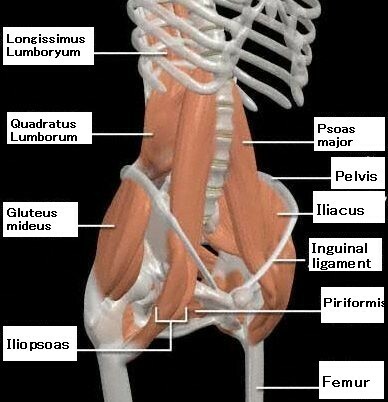 Pains, aches, injuries, syndromes, stages, parts, body systems…. That’s what the patients appeal to Shiatsu Professionals. All these patient treatment cases are only depending on the individual therapists’ talent, knowledge, skill, and experience. However, the other one component to be competent therapist is I think it is constant practice and experimental mind to figure it out. I like to find the meaning of Shiatsu Jikiden-kai (Shiatsu workshop) at this point. We try to reflect the blending of individuals, try to ask someone how they feel with other’s therapy and ask advice and then we recognize what the lack of the therapy. Altogether we devote ourselves to study and practice of shiatsu, and we have the opportunity to develop new ideas and to improve new skills and make progress day after day unwittingly. I think these things maybe the value of Shiatsu Jikiden-kai (work shop). Someday, we would call someone among us as Shiatsu Master or Shiatsu Expert! Any way, in my case, once more eventually, Shiatsu Jikiden-kai make me to realize about what my needs are all the fundamentals rather than techniques such as Patients’ condition, Sense of touch, and Pressure, pressure, pressure…. It is as if it happened at the Shaolin temple (少林寺), until a practitioner make positioning their name and fame into the top level list of certain martial art, the good teachers (sensei) always organize followers about basic skills, and remind them what they lack mostly, furthermore, teachers, followers, students, fellows, those practitioners (monks) all together mixed up at one place, and they constantly, regularly have discussion, practice and sparring. Through this kind of performing, I’m sure we also can provide better Shiatsu skill, better practitioner’s condition, furthermore the best Shiatsu therapy and healing service with best soul to the suffering patients at the real clinics. As if Shaolin martial art masters launch into the outside world and save the suffering public! I’ve heard that the biggest value what the Shaolin martial art masters look for is not actually the beautiful and ideal skills and is also not the higher fame and name. Eventually, the view point of their value is where they use for. What the shiatsu practitioner’s value is, the goal is to save the suffering patients, isn’t it? -p/s I had a great opportunity once again to think about those all things which I mentioned above, I like to thank ISI, Kiyoshi, and all the ISI members. 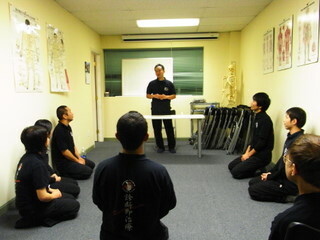 March 31st, 2010, Continuing Professional Eduation Program, Jikiden-kai was held at Yaletown Clinic. We did 15-20 minute treatments each other, matched to an individual sympton. Our March workshop was held on the 31st. A total of 12 members attended. The theme of this workshop was "treatments which match client’s chief complaints". During the workshop, each treatment was set at 15-20 minutes in order for each of the participants could partner-up with Kiyoshi. It is fundamental to ask clients about his/her chief complaints, to set up a treatment plan based on these complaints, and then to finish the treatment in the specified amount of time. This workshop provided a very good chance to practice these three fundamental steps. This was especially great for myself as I have just started to work at our clinics. While we worked on each partner, they would advise us as to how we were doing and what we should be adjusting to be more effective. I was thankful that I was able to receive advice from each partner while I was working on them. I think this is one of the best advantages of practicing Shiatsu in the environment compared to real treatments with clients in the clinics. During this workshop I was also able to get a better sense of a problem which had been bothering me. I had been having trouble with the direction and angles of applying pressure. When I treated Ikuko Sensei, she said “Oh, almost.” So I just changed the direction of my pressure without moving my thumb from its position. At that point Ikuko Sensei said "That’s the point!" I was not only happy because I had found the correct angle of pressure but also that I was able to feel the difference between the correct angle and the incorrect angle. Another thing I re-realized was the effectiveness of palm pressure. To be honest, I had thought that palm pressure paled in comparison to thumb pressure. However, Kiyoshi chose mainly palm pressure for treating my severe back pain! I was able to feel the tension around the waist be released by the application of palm pressure and feel muscle stretching. Kiyoshi skilfully adjusted the depth, rhythm, and direction of pressure. Though Shiatsu skill depends on how many treatments the therapist has given, I’ve heard that to receive Shiatsu treatments is also very important aspect of improving one’s skills. I’ve only attended this workshop twice, but I’m looking forward to attending the next workshop to be able to have the opportunity to receive treatment as well as to be able to give treatments while my partner guides my success. The workshop is paradise for me; it does not only teach me Shiatsu skills but also gives me the opportunity to receive comfortable treatments by experienced therapists. There are 3 things that I think we need to help us improve our Shiatsu skills. The first is to learn by watching treatments which other members are doing. The second is to remember how it feels to receive treatments by taking treatments. The last thing I feel helps us to improve our skills is giving many treatments. While working at the clinic, I get worried sometimes, wondering if I have applied pressure properly in the correct points. During the workshops I have attended, my partners have giving me feedback about the pressure I was using as I was giving treatments. Their comments have helped me to get an idea about how my pressure may have been felt by the clients in our clinics. Because there are 9 Shiatsu Professionals attending this past workshop, there were many treatments occurring which enabled me to be able to those 3 things. 1) Watching treatments being given. 2) Taking treatments to remember the feeling. 3) Giving treatments to apply your knowledge. I’d like to keep improving my skills in Shiatsu by continuing to refine these 3 steps. I really appreciate the workshops which we held, because they give me the opportunity to develop, practice and learn a wide variety of styles. March 8th, 2010, Continuing Professional Education Program, Jikiden-kai was held at Canadian College of Shiatsu Therapy Main Campus. Rozaly, Teruyo, and Yoshimi were in first time attendance. One of the reasons Teruyo applied to work for JSC Satellites was to attend the monthly workshops organized by ISI HR. The topic of this month's workshop was 'Frozen Shoulder'. 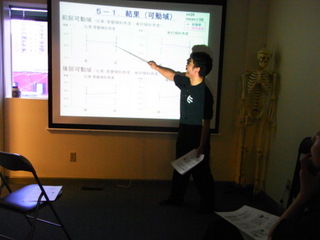 Yoko Sensei demonstrated seated position treatments and explained the shoulder cuff muscle group. Then Kiyoshi demonstrated reclining treatment on the floor. He treated with lateral-side position and focused on the cervical region and supra&infra scapular regions very much. After that, Shiatsu on Shoulder joint area again with the supine position. The one of the most impressional techniques is that he was moving the client's arm and pressing the affected areas at the same time. Toshinori and Yoshimi, who have been suffering from frozen shoulder were used as models for this treatment. As you can see the pictures, ROM of Yoshimi before and after is obvious. After the lecture, the attendee's practiced shiatsu on the floor each other, pretending that their partners are suffering from frozen shoulder. January 26th, 2010, Continuing Professional Education Program, Jikiden-kai was held at Canadian College of Shiatsu Therapy Main Campus. Firstly, we simply introduced ourselves for Toshiya and Toshinori, who just joined ISI. Then Akiko Sense explained about how the professional continuing education started and its purpose, and also Yoko Sensei reaffirmed the meaning of ISI. 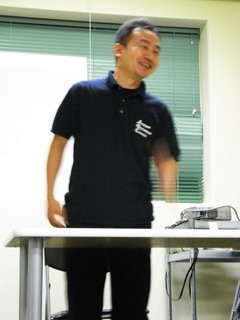 After that, Kiyoshi talked about tubo of Aze that was the same theme of the last workshop in briefly. Regarding tubo of Aze and Kai-atsu, please refer to Akiko’s report of the last workshop and Kiyoshi’s blog at any time. After Kiyoshi’s lecture, he gave us a demonstration of the treatment. Kiyoshi told us that the demonstration is just a sample approach, so as long as you follow the basics faithfully, then he hopes you can build it up on your way. The model for the demonstration was myself. It was the treatment of lumbar pain disorder: Alleviating tension in the abdomen often results in relation of the lumbar region as well, but due to limited time, Kiyoshi started the treatment with myself in the prone position. Firstly, Kiyoshi checked to see if the spine was straight or not. The cause of lower back pain could be the abnormality of hip joint angle → the length of the legs become different → scoliosis. Or the cause could by scoliosis → the abnormality of hip joint‘s angle → the length of the legs become different. Objective: Treatment seeks to improve blood flow and eliminate muscle tightness and alleviate pain. Treatment: Kiyoshi performed basic Shiatsu from infrascapular to the sacral region. The infrascapular regions were treated extensively in the three lines running along the spine. Then he treated the gluteal, posterior and lateral femoral and posterior crural regions. With the patient in the spine position, Kiyoshi checked the length of the legs again, then performed basic Shiatsu in the shorter leg first, from the inguinal region to the lateral crural region, then proceeded to the longer leg. Lastly, Kiyoshi regulated the length of the legs, by giving lateral rotation of the hip joint of the shorter leg, and medial rotation of the hip joint of the longer leg. Kiyoshi paid attention to my response carefully during the whole treatment. He treated around the joints especially thoroughly, and also he caught and treated the points where I noticed there was something going on as well, treating with extra care. His pressure was pleasurable, which meant Kai-atsu for myself. If I were to be treated again on another day, the pressure points and also the way of treatment would be different from the above, to adjust to my body condition. This is the way of the treatment based on tubo of Aze. After Kiyoshi’s demonstration, I asked him about some questions I had. Q: There are clients who want more and more pressure. Does satisfying the client mean giving him more pressure? A: I do not give strong pressure because of the client’s demand. Satisfying the client does not mean meeting his selfish demand. It means making the customer happy by giving proper Shiatsu. Keita continued by asking Kiyoshi a question. Q: My client, who had a car accident 10 years ago, wants strong pressure every time because his whole body was tight as a wall. How can I make him satisfied? A: Intend to take 10 years to get over it, because it took 10 years to build up the condition. The OS with whom I work with can make various clients happy by his shiatsu treatments that follow the principle of Shiatsu faithfully. I am wondering what my Shiatsu lacks. I feel that having good communication with each client is also important. I am sure that I need more experience. If I come across a difficulty, what I can do is to ask myself if my Shiatsu is based on the principle of Shiatsu that is "vertical pressure," "sustained pressure," and "concentrated." And also ask if I can catch right points or give pleasurable pressure to the client, while constantly seeking to improve my Shiatsu technique. After Kiyoshi’s demonstration, we treated each other. I gave Kiyoshi Shiatsu treatment because he offered to see if my pressure was weak. He advised me to add more “fluid pressure method” (to make change of the feeling of touch), and to relax my shoulder. Whenever I try to put more strength, my shoulder and arms lose flexibility and sensitivity. It was good to confirm that the other staff have stable posture and position that gives pressure by weight movement. And also there are things I could learn from the exchange with the new staff as well. Attending the meeting, I was able to recognize again what I need to learn to improve my Shiatsu.